Life for this large Polar Bear is quite relaxing while sitting on top of the rocks patiently waiting for the Hudson Bay in Churchill, Manitoba to freeze over. A Polar Bear in the Churchill Wildlife Management Area near the Hudson Bay in Churchill, Manitoba is debating whether he should wake up and mosey around or lay down for another nap. Until the Hudson Bay in Churchill freezes over, a Polar Bear this large needs to conserve his energy so he is prepared for his winter feeding days which lay ahead. Sitting on top of the rocks, this Polar Bear has moved around and been resting on and off in different areas since June with very little food. When the pack ice begins to form around the Hudson Bay, each Polar Bear will venture to the shores and use the pack ice as a form of transportation to reach the ringed seals. Large Polar Bears will be extremely hungry as some of them do not eat throughout the summer months. As hungry and weak as a Polar Bear may be at this time of year, does not mean that they are lacking any strength or endurance. A large Polar as well as the cubs, can still be extremely fast and strong and should never be approached at close range while bear watching. If feeling uneasy in any way, a Polar Bear can easily go from a sitting position into a threatening stance or run. The tours aboard the tundra buggies which leave daily from Churchill, Manitoba for bear watching, do not allow people to disembark for the safety of the people as well as the Polar Bears. Photographs are allowed to be taken from the tundra buggies and a cute picture of a large Polar Bear sitting on the rocks is a life long memory. Polar Bear, Ursus maritimus, in the Churchill Wildlife Management Area, Hudson Bay, Churchill, Manitoba, Canada. 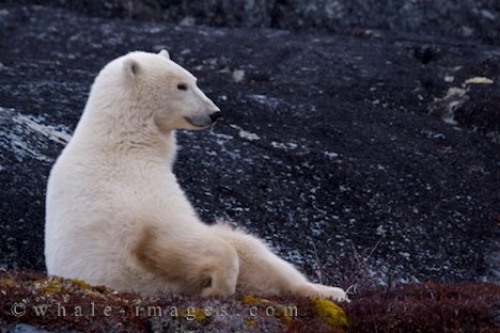 Please check out our special page with valuable scientific information facts about polar bears.